Close to 9,000 runners pounded the streets of Leeds on Sunday morning in the annual Abbey Dash 10k. Several of Peterborough’s top runners made the trip north, and Nene Valley’s Philippa Taylor had the most to celebrate at she picked up the prize for finishing first Over 50 female in a time of 38:38. Sean Beard made the top 500, finishing 484th in 37:34. Jay Belham and Simon Bell both made it round in under 40 minutes, while Ruth Jones’ clocking of 41:19 saw her finish 11th out of 770 in her Over 35 category. 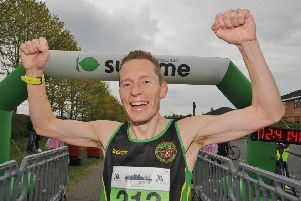 Two Peterborough AC men made their mark on the race with Steve Robinson coming home 192nd in 33:56, and James Skinner a minute behind in 251st. Nene Valley’s Megan Ellison won Wednesday’s second round of the popular 5k Harrier Handicap League at Lynch Wood in a time of 19:58. Ellison finished 37 seconds ahead of runner-up Sarah Cameron, and her brother Ethan, also of Nene Valley, came home third in 18:34. Bradley Allen of Nene Valley’s time of 17:05 was the fastest of the night and Ella Robinson, also of Nene Valley, was the quickest female with a 19:27 clocking. Gary Parr from Eye Community Runners currently leads the standings with father and daughter David and Alice Marr joint second.